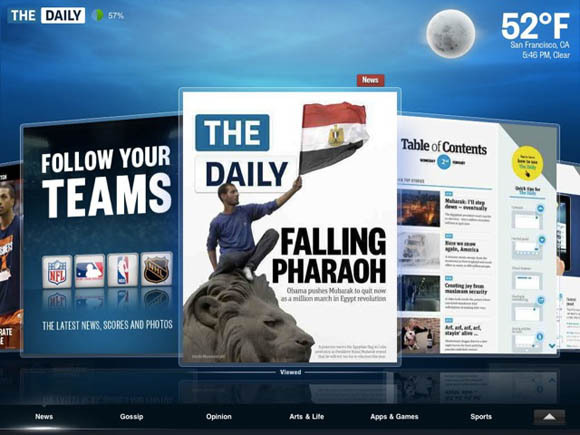 News Corp's long-anticipated newsy iPad app, The Daily, has launched in the US. Today it's only on the iPad, but Murdoch & Co plan to expand its reach to other tablets. "New times demand new journalism," News Corporation's chairman and CEO Rupert Murdoch announced during The Daily's roll-out event on Wednesday in New York City. "Our challenge was to take the best of traditional journalism – competitive, shoe-leather reporting, good editing, a skeptical eye – and combine it with the best contemporary technology," he said. The 100 pages or so of each issue of The Daily will be, as its name suggests, updated daily. In addition, breaking news can be pushed to the device, adding stories, photos, videos, and the like whenever its editorial team desires. A subscription will cost 99¢ per week – "14¢ a day," as Murdoch put it – and you'll be billed automatically by Apple. Alternatively, you can choose to sign up for a year for $40. For the next two weeks, issues of The Daily will be free – you can download the required iPad app here. Murdoch suggested that The Daily's low price per issue is a result of what he called the "transformative" economies of e-publishing: "No paper, no multimillion-dollar presses, no trucks." and an app and games section with reviews, ratings, and links to the App Store for purchases. The flick-to-browse central navigation screen, called The Carousel, will be familar to anyone who has ever browsed through iTunes Cover Flow on the iOS device or in an Mac OS X Finder window – or, for that matter, the navigation scheme of a Palm webOS device. As explained by News Corp's chief digital office John Miller, "The Daily is not an island. It will definitely be part of the web discourse and the social world." Readers can share individual articles through links to Facebook and Twitter, or over email. Although much of the content will also be hosted in HTML5 pages online behind a paywall, shared stories will be free. When pointing out The Daily's interaction with Twitter, Angelo said: "Obviously, the Twitterverse has changed how we communicate. It's changed how content is shared. We built components to bring Twitter feeds directly into the application." Demoing a "gossip item" about Elizabeth Hurley and Lily Allen, he noted that the app can display those two worthies' Twitter feeds "to let the stars speak for themselves." Apple was represented at the roll-out event by Eddy Cue, Cupertino's VP of internet services. When asked if Apple was going to extend News Corps' now-exclusive subscription model to other news services, he hedged, saying only: "You'll hear an announcement from us very soon for other news publications." Murdoch has high hopes for The Daily's profitability. "Our ambitions are very big, but our costs are very low," he said. "We have spent – I'll just be quite clear with you – in getting to this stage, with the development and everything, thirty million dollars," adding that the entire effort "will be running at less than half a million dollars a week." Speaking of what he sees as the enormous advertising potential of the platform, Murdoch said: "We're very confident of the finances, but we expect them to be quite revolutionized when we hit the big figures." Part of those big figures will come from extending The Daily's reach beyond Jobsian fondleslabs – eventually. "As other tablets get established," Murdoch said, "we will develop the technology to go on them. We expect to be on all major tablets. But we believe that last year, this year, and maybe next year, really belong to Apple. But that's just a market judgment." News Corp, of course, owns two right-leaning major media outlets in the US: The Wall Street Journal and Fox News. When editor Angelo was asked if The Daily's target demographic of younger, more-connected readers would affect its editorial tone, he responded: "We really want a new brand. We want a new voice. That's why we created The Daily. I think, in terms of our editorial page, at the very highest level we are patriotic, we love America, we are always going to say what we think is right for this country. We believe in free ideas, we believe in free people."